Jack Britten first painted in the early 1970’s before almost all of his contemporaries, including Rover Thomas (Top 200 Review) and Paddy Jaminji (Top 200 Review), had picked up a brush. Taught to paint by his grandparents his earliest works employed traditional materials such as bush gum, sap from the Bloodwood tree, and kangaroo blood to bind the ochres. In addition they exhibited a number of other traditional techniques. The manner in which he marked the dark surface of his canvases with zig zags, linear and dotted scrifito and paint is reminiscent of how the Gidja traditionally decorated their artifacts, slates and boab nuts in the region. These effects animated Brittens’ early works with their composite perspective of overlapping lateral depictions of country. Jack was born on Tickelara Station and worked as a stockman until well in to his late 40’s. Having moved to Nine Mile creek at Wyndham following the pastoral award in 1969, it was not until the establishment of the Warmun Community at Turkey Creek some 500 kilometers south of Wyndham during the mid 1970’s, that Jack returned to his traditional lands. He settled at Frog Hollow west of the Bungle Bungles, and despite a vast repertoire to draw upon, it is this region that became the most dominant subject of his art. In time he became its most senior living custodian. Britten’s most enduring works are moody atmospheric canvasses that matched his somber outlook on a life lived through turbulent times. He spent the majority of his career investigating subtle variations of mood and composition and left a sumptuous legacy of work of intriguing emotion. In paintings that spanned the entire length of his career, Jack Britten’s Bungle Bungles feature dark clusters of dome shaped mountains, layered with glistening white trails of dots imitating the layers of the pre-Devonian reef from which they were formed. In this work entitled Dungurrninning (the earthquake), Britten recalls a creation story from country on what became Texas Downs cattle station. The old people were by tradition the first to feast on the succulent fat grubs under the bark of the white river gum trees. On one occasion, the young people broke the law and ate all of the grubs. A huge black cloud suddenly developed overhead, causing a deluge of water never before seen - the ground opened up beneath their feet, and all were washed into the abyss (seen at top right of the work). Part of the ground didn't close up and can be seen today on that part of Texas station known as Gnargroon Country, in the form of the huge gorge Dungurrninning. 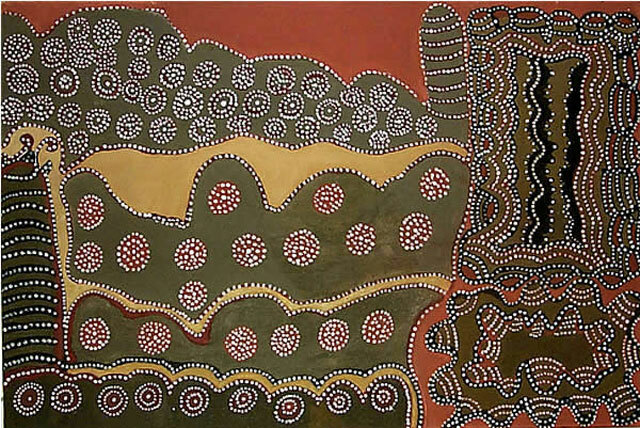 The painting measures 150 x 100 cm and was realized in natural earth pigments on stretched linen. It was painted for Narrangunny Art Traders, the trading name used by Maxine Taylor and Terry Brooks who became the first art coordinators in the Warmun community in 1997. The art centre under Taylor and Brooks operated as Warmun Traditional Artists until 1999 when a new constitution and incorporation led to the current Warmun Art Centre. While Jack Britten’s work was included in a number of important institutional exhibitions prior to 1990, and several commercial group shows from 1989 onward, his career was marked by a lack of good representation and individual promotion. He lived and painted principally at Frog Hollow and only visited Warmun to paint during the short tenure of Maxine Taylor as the first unfunded art coordinator in Turkey Creek. After she left the community Jack continued to paint for her exclusively until his death in 2002. Earlier works were painted for Waringarri Arts and Ochre Gallery in Kununurra and, until its closure, Goolarabooloo Arts in Broome. Jack however, did not like to travel far beyond the confines of his small community and relied for most of his career on others visiting him there. An important body of work was produced in this way for Vivien Anderson Gallery in the early 1990’s. Works by Jack Britten are appreciated for a distinct and altogether different sensibility to the Krill Krill boards associated with the origins of the East Kimberley style. His highest result is the $82,750 achieved by Sotheby’s for a 1989 depiction of Purnululu, which carried a pre-sale estimate of just $60,000-80,000 in 2005. All of his best 10 results were for paintings created prior to 1994 until a major 1998 triptych with each panel measuring 160 x 60 cm achieved his second highest result of $51,735 at Mossgreen in April 2008. In all, 86 works have sold out of the 144 offered resulting in a clearance rate of just over 60 percent. Only 21 works have sold for more than $10,000 with just 3 selling above $50,000 indicating a distinct reserve on the part of buyers for all but his very best works. These are appreciated for a charm born of the love and longing for the country of his birth. Jack Britten was an artist of the highest importance whose paintings are relatively inexpensive compared to those of his more illustrious contemporaries. They represent fantastic value for collectors who can still pick up works of great integrity at very reasonable prices indeed.